Flow cytometric staining of bovine peripheral blood lymphocytes. B. Mouse anti Bovine CD18 antibody, clone BAQ30A (MCA6086) followed by Goat anti Mouse IgG1:PE secondary antibody (STAR132PE). 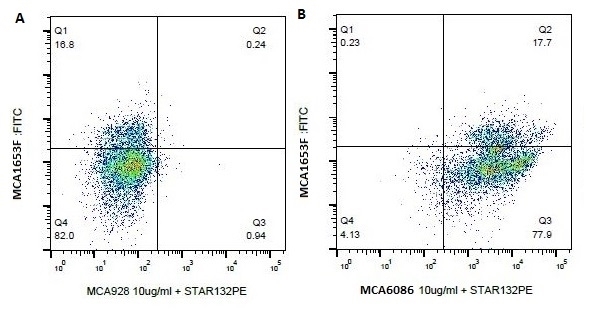 Both the Mouse IgG1 negative control and Mouse anti Bovine CD18 are plotted against bovine CD4 as recognized by FITC conjugated Mouse anti Bovine CD4 antibody, clone CC8 (MCA1653F). Mouse anti Bovine CD18, clone BAQ30A, recognizes bovine CD18 also known as ITGB2 or integrin beta-2. CD18 is a receptor for ICAM1, ICAM2, ICAM3, and ICAM4. It recognizes the G-P-R motif in the fibrinogen alpha chain and is involved in leukocyte adhesion as well as transmigration of T cells and neutrophils. Different from other organisms, the signal peptide of ruminant CD18, the beta subunit, is not cleaved and remains intact on the mature CD18 molecule, leukotoxin from Pasteurella haemolytica binds to the intact signal peptide on ruminant leukocytes causing acute inflammation and lung damage (Shanthalingam et al. 2016). Holstein cattle harbor a mutation in CD18 causing bovine leukocyte adhesion deficiency (BLAD) syndrome (Kehrli et al. 1992) with decreased expression of beta 2 integrins and lowered susceptibility to cytolysis in Pasteurella infections (Jeyaseelan et al. 2000). Howard C.J. & Naessens J (1993) Summary of workshop findings for cattle (tables 1 and 2). Saalmüller A. et al. (2005) Summary of the animal homologue section of HLDA8. Cell Immunol. 236 (1-2): 51-8.